Glaucoma can cause damage to the optic nerve which cannot be undone. The optic nerve carries the knowledge of what the eye sees to the brain for interpretation of what is seen. Think of the optic nerve as the cable that connects the eye to the brain. Without the intact, functional optic nerve, what the eye sees will never be interpreted and “seen” by the brain. An abnormal increase in intraocular pressure (IOP), which accompanies glaucoma, will eventually lead to blindness. Worldwide, glaucoma is the leading cause of blindness and in particular the leading cause of blindness in African Americans. 1 in 200 aged 50 or older will develop glaucoma. I in 10 over age 80 will develop glaucoma. In the United States, glaucoma is the second leading cause of blindness following the number one cause of cataracts. Eye injuries also claim the sight of countless people. Increased intraocular pressure is the major risk factor for those individuals with glaucoma. The aqueous humor production (in the front of the eye between the cornea-the clear covering of the front of the eye and the lens) by the ciliary processes and the continuous drainage of the aqueous humor through the trabecular meshwork is the control of intraocular pressure. Aqueous humor flows into the posterior chamber which has the boundaries of the lens, zonules of Zinn, and the iris. The aqueous humor drains via the Schlemm’s canal into the scleral plexus and general blood circulation. In the open angle glaucoma there is reduced flow through the trabecular meshwork. In closed angle the lens blocks iris is opposed to the lens and this blocks the flow from the posterior to the anterior chamber and then out of the trabecular meshwork. There are several sub-types of glaucoma, but all have the risk for optical neuropathy or inability of the optic nerve to function. Pressure in the eye above 21 mmHg is considered abnormal, but people will lose retinal ganglion cells at varying increased pressures. Some people may have increased pressure for years and not develop damage. Untreated, increased pressure within the eye leads to permanent damage to the optic nerve and loss of vision. Increased/abnormal pressure within the eye is not the only cause of glaucoma. Glaucoma may be either closed or open angle. Closed angle appears suddenly and is often very painful, visual loss can progress quickly but usually the pain will get the patient to the doctor before much damage is done. This is a medical emergency and prompt treatment is essential to relieve increased intraocular pressure and consequent damage to the structures of the eye. The fluid that the eye continuously produces does not exit the eye and pressure builds up. There will be sudden, severe pain on one eye and then the progression to cloudy vision with possible rainbow colors around lights. There may also be nausea and vomiting and red and swollen eyes. Open angle, which is the most common, progresses at a slower rate and the disease may progress significantly before the patient notices anything wrong. Vision will disappear from the edges of the eye, the peripheral area of vision, also known as tunnel vision. Your sight is like looking through a tunnel with dark areas all around the tunnel opening. There is also congenital glaucoma (hereditary) and secondary glaucoma. Open angle tends to run in families so if you have a parent or grandparent with glaucoma, you should be checked. The cause for this type of glaucoma is not known.Congenital glaucoma runs in families and is the result of altered structures of the eye which does not allow for the continuous draining of the excess aqueous humor. A baby or child will have tearing, red eyes, enlargement of one or both eyes, and sensitivity to light. The baby or child will not be able to tell you this, but he or she will not be able to see objects clearly. This type of glaucoma is always treated with surgery to create an opening for fluid to drain away as more is produced. Secondary glaucoma may be caused by certain medications such as corticosteroids, eye surgery that alters the overall eye structure, diseases of the eye such as uveitis, and other infections and disease that can affect your body system in general.You may initially have glaucoma in just one eye, but your other eye may also develop this problem. Your doctor will be able to help you to avoid this issue with the use of preventative measures. Eye drops which dilate the iris for ocular examinations may trigger a sudden attack of glaucoma, due to the fact that the fluid which should be continuously leaving the eye is blocked by the change in the size of the pupil (dark portion of the eye that changes shape due to the amount of light that shines onto the eye). Testing for glaucoma should include measurements of the intraocular pressure via tonometry, changes in size or shape of the eye, anterior chamber angle examination or gonioscopy, and examination of the optic nerve to look for any visible damage to it, or change in the cup-to-disc ratio and also rim appearance and vascular change. 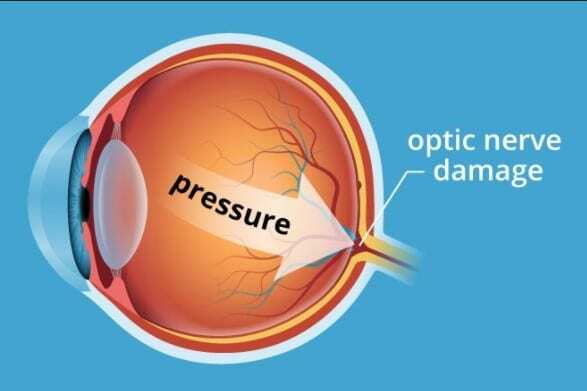 The warning is that an intraocular pressure may be normal when tested, but pressure can be elevated later on as the fluid builds up in the eye. Twenty-five percent of the people who have glaucoma (normal-tension glaucoma) will have normal intraocular pressure. Only one half of the people who have glaucoma, know that they have it. That leaves many who may be untreated and consequently lose their eye sight. Intraocular pressure can be lowered with medication, usually eye drops, perhaps more than one prescription. There are several different classes of medications to treat glaucoma with several different medications in each class. Each of these medicines may have local and systemic side effects. Adherence to medication protocol can be confusing and expensive. If side effects occur, the patient must be willing either to tolerate these, or to communicate with the treating physician to improve the drug regimen. Initially, glaucoma drops may reasonably be started in either one or in both eyes. Poor compliance with medications and follow-up visits is a major reason for vision loss in glaucoma patients. A 2003 study of patients in an HMO found that half failed to fill their prescription the first time and one in four failed to refill their prescriptions a second time. Patient education and communication must be ongoing to sustain successful treatment plans for this lifelong disease with no early symptoms. Canaloplasty is a nonpenetrating procedure utilizing microcatheter technology. To perform a canaloplasty, an incision is made into the eye to gain access to Schlemm’s canal. A microcatheter will circumnavigate the canal around the iris, enlarging the main drainage channel and its smaller collector channels through the injection of a sterile, gel-like material called viscoelastic. The catheter is then removed and a suture is placed within the canal and tightened. By opening the canal, the pressure inside the eye may be relieved, although the reason is unclear since the canal (of Schlemm) does not have any significant fluid resistance in glaucoma or healthy eyes. Laser trabeculoplasty may be used to treat open angle glaucoma. It is a temporary solution, not a cure. A laser spot is aimed at the trabecular meshwork to stimulate opening of the mesh to allow more outflow of aqueous fluid. Usually, half of the angle is treated at a time. Traditional laser trabeculoplasty utilizes a thermal argon laser. The procedure is called Argon Laser Trabeculoplasty or ALT. A newer type of laser trabeculoplasty exists that uses a “cold” (non-thermal) laser to stimulate drainage in the trabecular meshwork. A surgical procedure called a trabeculectomy is the most common conventional surgery performed for glaucoma. A partial thickness flap is made in the scleral wall of the eye, and a window opening made under the flap to remove a portion of the trabecular meshwork. The scleral flap is then sutured loosely back in place. This allows fluid to flow out of the eye through this opening, resulting in lowered intraocular pressure and the formation of a bleb or fluid bubble on the surface of the eye. Scarring can occur around or over the flap opening, causing it to become less effective or lose effectiveness altogether. One person can have multiple surgical procedures of the same or different types. There are also alternative medication therapies that can be prescribed. There are also several different glaucoma drainage implants which you can discuss with your surgeon if you need to have one inserted. If you have sudden pain in one or both eyes and or a decreased ability to see, especially in the outer area of your vision, go to the emergency room or seek care from a professional immediately. Regular eye exams are essential. Many commercial markets, such as your local Sam’s Club, have optic departments and will make appointments for an affordable visit to have the pressure in your eyes checked. Regular eye checks should be performed to catch the beginnings of glaucoma. You cannot prevent glaucoma, but your prompt attention to changes in your sight or sudden eye pain can help to alleviate permanent eye issues, such as optical nerve damage and blindness of varying degrees. Early diagnosis and treatment is the key to maintaining your eyesight. Everyone over the age of 40 should have an eye exam at least every five years, but more often if you have a history of glaucoma in your family and if you are of African American descent. Kwon YH, Figert JH, Kuehn MH, & Alward WL. Primary open-angle glaucoma. New England Journal of Medicine. 2009 Mar 12;360(11):1113-24. After growing my own, back in the day; we used acetone as an organic solvent, then purified the extract with activated charcoal under suction. we then wound up with what we called honey oil. Oh well I’m sure whatever people do nowadays is similar. the problem is figuring out a therapudic dose. Moderation is probably the way to go. You are stimulating CB1 and CB2 receptor sites to kick your immune system into full speed ahead. After watching my Mother go through conventional cancer treatment I can only hope that cannabus works. Yes, you are absolutely right Eduardo and I did experiment with MJ and it works. But at the time I was flying alot in Alaska and when not flying I was working some big construction jobs that gave you urine tests in order to stay on the job. It seemed that every job I took had a urine test with it so I gave up on the MJ thing. I now live where they don’t even have it around – as far as I know. I have a small wood/mech. shop here and with my glasses I can still cut a straight board. I just finished a total rebuild on a 1991 350cc IZH Planeta with a side car and looks good. I do have a couple blind spots but I have figured out how to deal with them. Thanks and I always enjoy reading VT and the comments. I did not specifically mention Marijuana, and it does lower pressure, but the long term treatment is to keep the aqueous humor draining from the eye, as more is constantly being produced. I mentioned alternative medication and marijuana would fall into the category. Very succinct and informative; could you write a piece on Macular Degeneration? Thanks, us ol’ folks read alot, while we still can see. Will do. Keep checking back. Great article Carol- I tried to get the VA to do a glaucoma operation while they corrected a cataract but they wouldn’t . In fact they wouldn’t schedule me at all and I have had it since 1990. So I live in a foreign country where xalatan and timolol is cheap, but I can see the loss I have. I take the drops still and I just don’t care anymore. True Satire –Sooo, I was in Saint Petersburg, Ru going across a busy street and I see an older blind man crossing and I go over to help him. First I speak russian and I told him I have glaucoma and he said – that’s what I had. He says where are you from ? I said Alaska/ Amerikanska and he laughs. Now, we across the street and he thinks for a few minutes and says in a Humphrey Bogart voice – hey buddy – can you spare five bucks? I couldn’t stop laughin. I gave him 300 rubles and we walked down the sidewalk talking for some time. Yes, its a serious disease and i’ve seen it from the Arctic to Russia but it should be treated – not only when you are old enough that the doctors think the surgery will continue to work but when it it first noticed and it should be — Free. I’ll bet I spent over 25,000 bucks cash on drops, photos of my optic nerve and tests etc. since I’ve had it. I understand what you are saying….and ,yes, medical marijuana has been used in the treatment of this insidious disease. Did the Bros down in the Hooches in Nam anticipate the need to relieve the symptoms of Glaucoma? Does dilation of the pupils relieve pressure on the retina? Is this a possible call to prevent the police harrassment of minorities for possession of small amounts of dac on medical grounds? On the other hand, the unfortunate statistic of 10% of returning USA soldiers out of Viet Nam were at one stage reported to have had heroin in their blood. That debate never really got going and it was turned into “The War On Drugs” (c.f. Iran Contra), similar to “The War On Terror” (c.f. Afghanistan, Iraq, Syria etc. ), whereby the CIA et al. control both sides of the dialectic and profit thereoff.